This video wasn’t supposed to go up until Sunday, but something odd and enthusiastic happened with my Youtube scheduling, so here it is: the December favourites. I spend almost the entire video wearing hair rollers, which is a bit weird, but there are some real beauty finds in this month’s round-up so do give the video a go! Ooh – a quick note about Beauty Pie. I filmed this video straight after hearing about this new makeup subscription service, Beauty Pie, which gives you “luxury” cosmetics at cost price – NO mark-up – so long as you pay their monthly fee. Now at the time of filming, I did quite enjoy the idea of this concept – it was new, fresh and seemed to be about to shake things up a bit in the beauty world. Nothing wrong with that. But in the few weeks that have gone by since filming, I’ve had a good old think about the whole thing and also tried quite a lot of the products and I’m just not sure that it’s something I buy into. The £10 a month fee gives you access to all of their makeup at cost price (so, for example, a lipstick at £2.24 rather than twenty-odd quid) but that’s with a five pounds shipping and handling charge on top and so all of a sudden, if you just want to buy a lipstick that month as a treat, you’re almost up to the cost of a luxury lipstick anyway. And the luxury one, say Dior or what have you, would be beautifully packaged and would feel like a proper treat. So I’m torn. 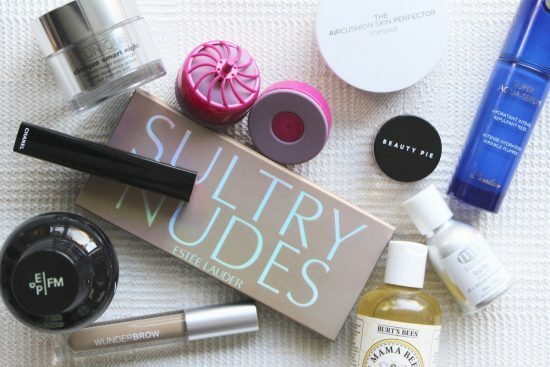 There are some lovely products, and the site looks great – really swish and Net-a-Porter-y, but do people really want to shop for their beauty in this way? Or would they rather have the freedom to shop from a wide range of brands whenever they fancy? I just can’t see many people wanting to sign up to a monthly commitment like this. What are your thoughts? Let me know in the comments! You can read more about Beauty Pie here.